Hi, there! I'm so glad to see you! I haven't posted for a while because my craft room was being renovated and modernized, of which I'll post pictures another time. I've been going on business trips with my husband, too. He's been working in adjoining states to Tennessee, so we've been able to do a little camping in our fifth-wheel trailer rather than stay in a hotel. It's a blessing for us to spend more time together, and his employer pays for the camp ground space - saves them money, so it's a Win-Win for all of us. It's been fun! I've been creating a few cards using a dusky rose shade and brown cardstock, which is becoming a favorite combination of colors for me. I really like the feminine, vintage feel of some of them. The card above was very easy to make using the Spellbinders Grand dies for the card itself. I cut a piece of white cardstock, overlapping the top edge of the die slightly, so that I didn't end up with two separate pieces, but that the card was still attached along the top. 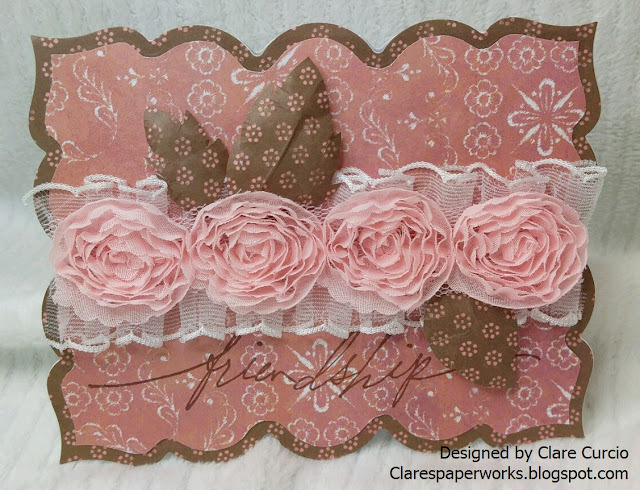 The dusky rose background piece was adhered to the brown patterned base mat after applying the lace. These two layers of colored and patterned cardstock were adhered over the white base. The word, "friendship" from Stampin' Up was stamped in brown ink below the white lace. I punched out some leaves and shaped them with an embossing stylus, then glued them along the lace roses, using pop-ups. And voila, finis! The image on the above card was double-stamped in Stampin' Up Smoky Slate ink on white cardstock, and both images were colored in using Stampin' Up markers. The top layered image was fussy-cut out, and applied with pop-ups. The swirly die cut at the bottom of the pink card base is from Heartfelt Creations, called Regal Borders and Pockets. The white die cut image is from Spellbinders, called 5 x 7 Detailed Scallops. I roughened up the edges of the card a little, added some lace across the bottom, just below the lower edge of the Scallop die cut, and added a little bow made from white sheer 3/8" ribbon. 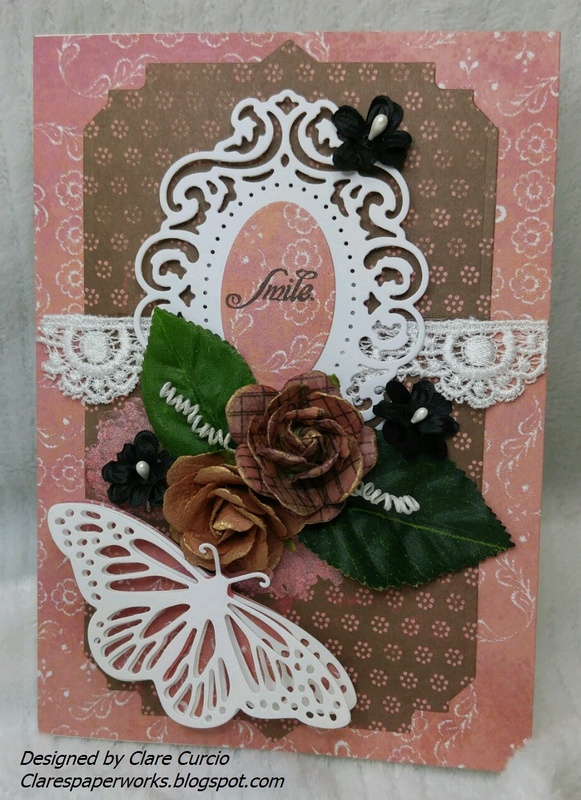 This last card is a 5 x 7" dusky rose background on white cardstock, with a brown patterned base cut with Spellbinders Nestabilities Art Deco. 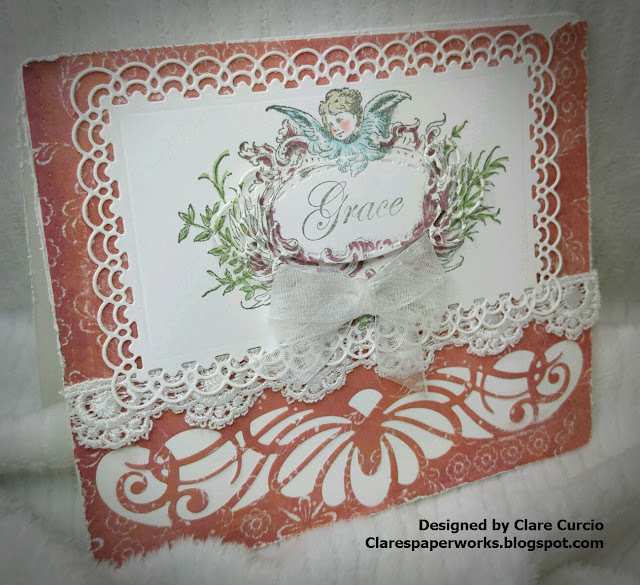 These two were adhered directly to the white cardstock base, with some white lace applied across the top, centered on the card. The white die cut is from Spellbinders called Reflection, which reminds me of a vintage mirror frame. The sentiment was stamped in black, and is from my stash. The rose leaves were cut from some plastic roses I had left over from wedding decorations, and fit well with the purchased paper roses. The little black flowers were from my stash, and are fabric. The white paper-covered wire was twisted around a pair of jewelry pliers and glued in place. The butterfly was cut out twice, using the wonderful die from Impression Obsession, and the top one was popped-up for dimension. Thank you for stopping by - I hope your summer has been a great one! It's been hot here in Tennessee, with quite a bit of rain. Happy creating!